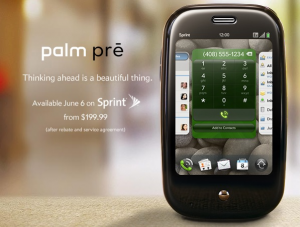 Sprint has announced the release dates of the most awaited Palm Pre smartphones powered by Palm web OS .The device will be available from June 6 of this year , for a price of 200 $ and 2 year contract . Palm PDA devices were using an older operating system which failed to grab attention in recent days . The launch of iPhone and new smartphones affected the sales of Palm and they are rebranding their devices with this new OS .Palm pre ,the first device based on Web OS had already created much hype with its features and advanced web technologies it supports . Palm Pre is powerd by Texas Instruments OMAP3430 microprocessor, a 600 MHz ARM Cortex A8 CPU, PowerVR SGX 530 GPU and 430 MHz C64x+ DSP + ISP (Image Signal Processor) . Excellent web experience , the trademark of Plam web OS . Bluetooth (A2DP),WiFi ,GPS and 3G. Email , MMS and other normal functions . All other feature can be found here . Palm web OS is compatible with latest web technologies like HTML5 , CSS , Flash streaming videos etc . 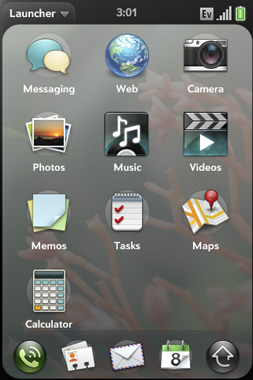 A developer SDK for Palm Web OS is already available here . Indian release dates , price and Operator details of Palm Pre are not available yet . Updated: Palm and HP announced Palm Pre 2 smartphone.